The lawsuit stems from a discovery in April 2011 that iOS versions 4.1 and later had been storing location co-ordinates from June 21, 2010, through April 27, 2011 even if Location Services had been turned off. Once the discovery was made public, Apple resolved the issue with a firmware update. 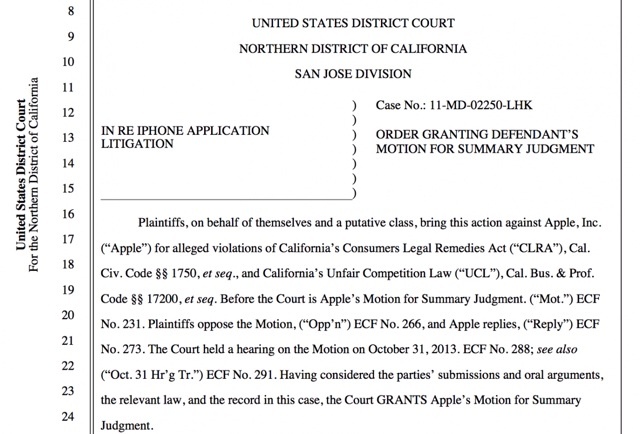 U.S. District Judge Lucy H. Koh dismissed the case against Apple saying, "Plaintiffs must be able to provide some evidence that they saw one or more of Apple's alleged misrepresentations, that they actually relied on those misrepresentations, and that they were harmed thereby."